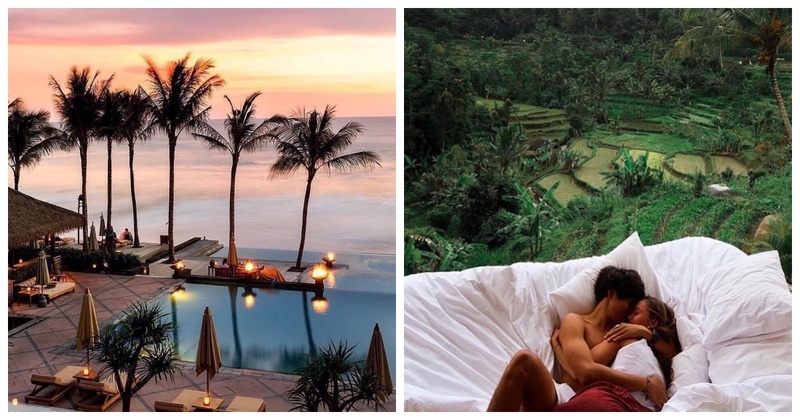 8 Honeymoon Destinations outside India which will NOT burn a hole in your pocket! Is the wedding costing you a bomb? At the same time you wish to have your dreamy, romantic honeymoon at an international destination? Luckily for you, the WZMassiah is here! I found 12 of the best international destinations for your honeymoon on a budget! Have your pick, dearies! Greece, the beautiful southeastern country of Europe is heaven on earth if I mince my words and it’s definitely one of the cheap honeymoon destinations outside India! The thousands of islands here are so beautiful, you’ll want to pack your boriya-bistra and settle down forever! Rich in history and culture, it’s easy to draw parallels between Greek and Indian mythology. The love you’ll receive from locals will warm you up! Don’t forget to take a dip in the hot springs of the Aegean Sea! Airfare: Bombay to Athens- INR 24,500 onwards if booked 5 months in advance. New Delhi to Athens- INR 23,000 onwards if booked 5 months in advance. Places to Visit: Athens, Mykonos, Santorini, Corfu Islands and Rhodes. Things to Do: Greece is all about the sea so you’ve to try the water sports! Pro tip: Corfu islands will give you all the privacy you require..ahem! Know more about Greece here. Stunning landscapes, beaches, colonial structure and a rich heritage are a few words that accurately describe Vietnam. One of the most inexpensive destinations, Vietnam will be quite easy on your pocket. Romance is definitely not lacking here! Vietnam as a honeymoon destination will surely NOT burn a hole in your pocket after that big fat Indian wedding! Airfare: Bombay to Vietnam- INR 18,000 onwards if booked 5 months in advance. New Delhi to Vietnam- INR 10,000 onwards if booked 5 months in advance. Places to visit: Hanoi, Hoi An, Ho Chi Minh City, etc. Things to do: Cruise rides, boat trips, cycling, cave explorations, etc. Pro tip: You have to try the insanely popular and delicious pho! Know more about Vietnam here. The Koreans have taken over the pop music and drama world by storm. South Korea is definitely worth visiting for its stunning beauty, world class skiing resorts and endless shopping spree. The Jeju Islands is a hit amongst newly weds. Airfare: Bombay to South Korea: INR 18,700 onwards if booked 5 months in advance. New Delhi to South Korea: INR 21,000 onwards if booked 5 months in advance. Places to visit: Seoul, Jeju Islands, Gangwon, Busan, etc. Things to do: Shopping in Seoul, attend Jinju lantern festival, etc. Pro tip: Bow slightly first before you talk to someone senior. Know more about South Korea here. Fancy ancient monuments, lip smacking food and a an amalgamation of Asia and Europe? Then Turkey is the place for you! Turkey is a unique combination of history and beaches.. Everything in this country is jaw dropping! Airfare: Bombay to Turkey- INR 16,200 onwards if booked 5 months in advance. New Delhi to Turkey- INR 17,800 onwards if booked 5 months in advance. Places to visit: Topkapi Palace, Aspendos, Pamukkale, Istanbul, etc. Things to do: Camping, trekking, cycling, sunbathing, shopping, etc. Know more about Turkey here. The host city of MasterChef Asia, Singapore is a mixing pot of cultures and ethnicities. The metropolitan environment will lift your spirits as you dine mid air with your beloved or cruise along the Singapore river. Singapore is much more than Krissh has shown us. You might want to see that for yourself! Airfare: Bombay to Singapore- INR 9,000 onwards if booked 5 months in advance. Places to visit: Sentosa, Marina Bay Sands, Bukit Batok Town Park, etc. Things to do: Dinner at Jewel Park, play with dolphins at St. John Islands, etc. Pro tip: Experience the one of a kind chocolate and cheese bar at Sands SkyPark Hotel. Know more about Singapore here. The happiest country in the world, Bhutan as an international honeymoon destination will have you smiling widely instantly. The picturesque valleys and A1 hospitality will make your day. Cheese is one of the staples there so don’t forget to try the cheese chilli curry with rice! The best way to reach Bhutan is to take a flight to Bagdogra and then travel by train. Airfare: Bombay to Bagdogra- INR 5,000 onwards if booked 4 months in advance. New Delhi to Bagdogra- INR 3,200 onwards if booked 4 months in advance. Places to visit: Paro Valley, Throngsa, Thimphu, etc. Things to do: Meditate at the monasteries, mingle with the locals and try the local cuisine! Pro tip: Spring is the best time to visit this quaint place. Know more about Bhutan here. One of the most breathtaking places in the world, Seychelles is also a hotspot international honeymoon destination. It feels like everyone is in the honeymoon mood and so deeply lost in other’s eyes! The crystal blue waters and white sandy beaches should be enough to convince you to select Seychelles as your honeymoon destination. Airfare: Bombay to Seychelles- INR 16,000 onwards if booked 5 months in advance. New Delhi to Seychelles- INR 16,000 onwards if booked 5 months in advance. Things to do: Zip lining, snorkelling, island hopping, luxury yacht ride, etc. Pro tip: One doesn’t forget to carry sunscreen in Seychelles! Know more about Seychelles here. UAE, the gulf country with 7 jewels is a budget friendly and honeymoon worthy destination. Dubai, Abu Dhabi and Sharjah are the tourist hotspots. The sheer beauty of the gulf will leave you spell bound! Airfare: Bombay to Dubai- INR 8,000 onwards if booked 5 months in advance. New Delhi to Dubai- INR 7,000 onwards if booked 5 months in advance. Places to visit- Burj Khalifa in Dubai, Sheikh Zayed mosque in Abu Dhabi, Sharjah Arts Museum in Sharjah, etc. Things to do- Visit the mosques, Dubai shopping mall, etc. Pro tip- The Emirates follow a few rules and regulations that are also applicable to the tourists too. Read up before heading to the UAE. Know more about the UAE here. Life is so much better when you’ve budget friendly international destinations to make your honeymoon lovelier and pockets heavier!